One of the illustrations is from an elderly Punch cartoon publication, entitled Mr Punch at The Seaside and published around 1910 (not absolutely sure as no date printed within, although various sources date it from this period give or take a year). The person cited as the author lived from 1821 until 1891. Whilst it is my understanding that copyright ceases 70 years after the death of the author (so well out of copyright on this count), I'm not sure whether this still applies in the case of huge publishing houses which survived until relatively recent times. Do Punch have ongoing claim on the huge volume of historical content which they published during the Victorian and Edwardian periods? The other query which I have is a little more muddled, so I'm hoping this will make sense. 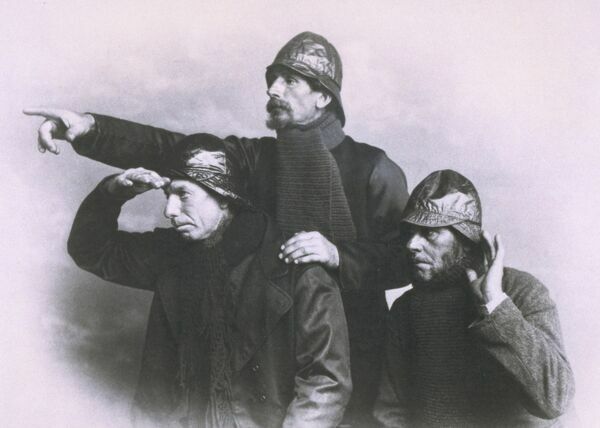 I would like to use the now fairly famous image of three Victorian lifeboatmen (who appear to be gazing intently at an unnamed peril on the horizon). This was, I understand, originally a photograph taken by a WH Franklin of Deal, Kent. An etching/engraving of the same trio and entitled 'The Boom Of A Distant Gun' subsequently appeared in a book by Thomas Stanley Treanor in 1904 and was annotated 'from a photograph by WH Franklin'. I would be happy to use either the photo or engraved version in my embroidery. I've tried searching for details of WH Franklin but can find little (although the NPG has one of his photographs and gives his date of death as 1891). TS Treanor died in 1939. On both counts it would seem that either of these images might be used by me, but I'm a little concerned that the RNLI uses the photographic version on some of its merchandise but credits it as copyright 'WH Franklin'. Have I muddled something up here? Do the RNLI know something that I don't? Do they have any rights over the image? I am obviously anxious not to find myself clapped in irons for copyright infringement, so would be very glad for any help you could offer me. Very many thanks. Based on what you have discovered about these two images and their creators, I think you can safely go ahead and use them as the basis for your embroidery. Under UK copyright law the length of the term of copyright has, in most cases, always been determined by the date of death of the author, plus either 50 years (up to the introduction of new EU rules in 1995) or more recently, 70 years. On this basis as you have said, both images are now out of copyright. The sort of special cases where the basic rules don't apply mainly concern unpublished works, anonymous or pseudonymous works, and very early photographs. As the Punch drawing appears to have been published after the death of the artist, copyright in that instance was activated by the act of publication, and under the 1911 Copyright Act, would have then lasted for 50 years. Even if the drawing had been re-published, this would not have affected the termination of the copyright in around 1950, assuming that your information about the initial date of publication is correct. it is much the same story, except that we don't know when WH Franklin's photograph was first published. However it is safe to assume that it must have been before 1904 when the engraving by Mr Treanor was published. But in any case, as I mentioned above, early photographs were treated differently to other artistic works, and were only protected for 50 years from the date they were made, irrespective of whether they were published or not. Whether Mr Treanor obtained permission to make his version is unknown, and fortunately it doesn't matter either, because while Mr Treanor may have had a separate copyright in his work, he too died sufficiently long ago for his engraving to be out of copyright, along with Mr Franklin's image. The fact that the RNLI are claiming copyright means absolutely nothing. Because they claim it in the name of WH Franklin, there is no doubt that the image is now in the public domain, since we know Franklin's date of death. Unfortunately there is nothing in law to prevent this sort of false claim. If one is being charitable, perhaps it arises from the laudable purpose of crediting Mr Franklin as the photographer, while rather overlooking the fact that it is a misleading statement as far as copyright is concerned. That is why I have used the image here in this posting, not only because its use would be covered by fair dealing, but because I find it annoying that some institutions who should know better, adopt this sort of strategy to protect their merchandise. Incidentally, once you have completed your embroideries, you will have the copyright in them, since they will be original works of artistic craftsmanship, notwithstanding the fact that you have drawn your inspiration from the earlier works. This is the entire rationale for copyright works entering the public domain, so that they may inspire more creativity. Thank you so much for your very speedy and thorough reply - I am so grateful for your help as I have been pondering over this for some while. I usually 'play safe' and use Dover or Graphics Fairy images, but these have been of limited use with this particular project, as they tend not to have too much content relating to small English seaside towns! I will be taking up my needle shortly. Very many thanks again.